American Library Association President Loida Garcia-Febo (at podium) addresses the crowd at the High Prairie Library Harvest Festival in Falcon, Colorado, as part of her Libraries = Strong Communities tour. ALA President Loida Garcia-Febo launched her Libraries = Strong Communities tour October 5 with a visit to Pikes Peak Library District (PPLD) in Colorado Springs, Colorado. Libraries = Strong Communities is a national advocacy effort aimed at highlighting the value of academic, public, and school libraries. 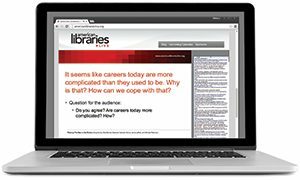 The goal is to ignite public awareness of the value of libraries and library workers and create a groundswell of support at the local, state, national, and even global level. Garcia-Febo says she chose PPLD as one of the six destinations because of the vital resources and opportunities the district provides through its 14 library branches and mobile and online services. 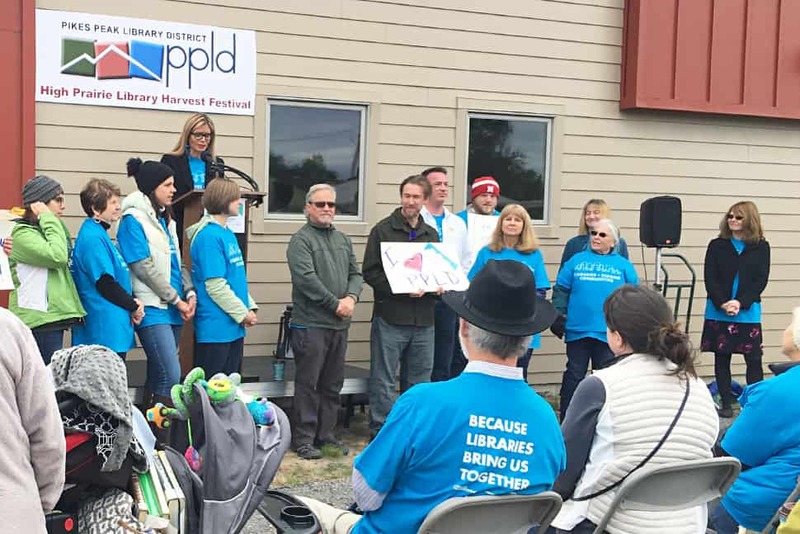 PPLD is the second-largest library system in Colorado, serving more than 600,000 residents in El Paso County, thanks to a base of 500-plus full- and part-time staff members and nearly 2,000 volunteers. Garcia-Febo’s first stop came October 5 at the Sand Creek branch, where she addressed the crowd in Spanish at the library’s Culture Mash, a celebration of multiculturalism and diversity held in connection with the All Pikes Peak Reads program. Running September 10–November 17, the program promotes books that explore themes of diversity, multiculturalism, compassion, immigration, endurance, resiliency, and hope. From there, Garcia-Febo headed to Library 21c, which the district calls its “launchpad” for 21st-century library service, with 3D printers, sewing machines, a video story booth, and other opportunities for experiential learning. She engaged in a fireside chat–style discussion with John Spears, PPLD chief librarian and CEO, for the Pikes Peak Women’s Powerful Women series, also part of All Pikes Peak Reads. During their conversation, Garcia-Febo and Spears explored the impact of the reading program’s themes on the future of libraries and strong communities. At the event, Garcia-Febo says two library workers in attendance were brought to tears, saying they were happy the president of ALA was speaking up for libraries and spreading the message about what libraries are doing to serve everyone in the community. The visit culminated on October 6 at PPLD’s annual Harvest Festival, held at High Prairie Library (HPL) in Falcon, Colorado. The festival featured a cookie contest, a marshmallow catapult, and a pumpkin-growing contest with pumpkins grown from HPL’s seed bank. Garcia-Febo participated as a guest judge of the annual costume contest. Library and community leaders gathered for a pro-libraries rally at the festival. Among the speakers was Colorado Association of Libraries (CAL) President Carol E. Smith, university librarian at Colorado School of Mines. Dave Ahrens, president of the Eastern Plains Chamber of Commerce, told the crowd that the library is a major resource center for entrepreneurs and business owners and singled out PPLD Business Services Librarian Terry Zarsky for praise. She also spoke on behalf of Colorado ballot initiatives to benefit libraries in November, including a proposal to raise an additional $11.6 million in operating funds for the Anythink Libraries in Adams County and a $180 million bond measure to upgrade school libraries and media centers in Colorado Springs. 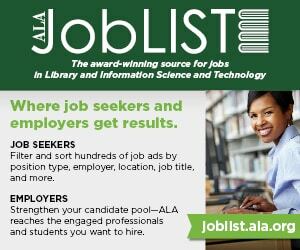 Garcia-Febo encourages libraries around the US to hold similar rallies, adding that ALA has resources that can help, including “Because” statements through its Libraries = Strong Communities campaign site. The remaining stops on the Libraries = Strong Communities tour will be Cambridge (Mass.) Public Library, October 18; Seattle Public Library, January 26; North Miami Public Library, February 9; and Los Angeles Public Library, May 15. The tour will conclude on June 22 during the ALA Annual Conference and Exhibition in Washington, D.C.